1. Cut stalks off shiitake mushrooms and reserve. Slice all mushrooms, keeping shiitake and button mushrooms separate. Set aside. 2. Put stock into a saucepan together with the shiitake mushroom stalks, lemon grass, ginger, lime juice, lime leaf and shoyu. Bring to the boil and simmer for 15 minutes. Strain, reserving liquid and discarding vegetables. Return liquid to pan and reheat. 3. Add sliced shiitake mushrooms to the pan and simmer for 10 minutes*. Meanwhile sauté the garlic and button mushrooms in about 30ml / 2 tablespoons of oil, stirring all the time, until the mushrooms are softened. Add mushrooms and garlic to the pan. 4. Cook noodles according to packet instructions. 5. 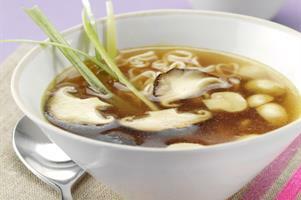 Divide the noodles between four soup bowls and pour the hot soup over them, dividing the mushrooms between the bowls. Garnish with shredded spring onions and serve with chilli sauce. For a summer version: thicken the soup with 30ml/ 2 tablespoons of cornflour mixed with a little water. Gradually stir this mixture into the soup at the end of the simmering time. Chill. Omit the noodles and instead, garnish with finely chopped red pepper and spring onions. If liked, add a teaspoon or two of sherry to each bowl of soup.